Last night was workshop 2 of the six week Start Your Own Business Programme delivered on behalf of Clare CEB . We discussed marketing research for startup businesses. This blogpost will talk about Secondary Market Research. I am always amazed at the information which is out there! Marketing Research is hugely important for the promoters of new business endeavours to include: new products; geographic or market expansion of an existing product; or start-up businesses. So once you have decided what information you would like to have (see bulleted list) it is time to identify how this information can be sourced. There are two main sources of data – primary and secondary. Primary research is conducted directly by or on behalf of the business. It is original and collected to solve the problem in hand. Secondary research, also known as desk research, already exists since it has been collected for other purposes. Secondary research can provide both quantitative and qualitative information. Qualitative information involves describing meaning, rather than with drawing statistical inferences. It provides more in depth and rich descriptions.If the information involves a measurement of any kind, it is considered quantitative information. Secondary research reports can be expensive. However, extracts and summaries may be found online. Enterprise Ireland (and the Enterprise Boards) has developed a significant databank of information across industries, markets and sectors. They may have purchased professional market research reports on the particular sector being researched. These are particularly valuable for international market research. Reports compiled by organisations such as Frost & Sullivan, Mintel, IDC, Euromonitor, AC Nielsen and Forrester can contain valuable information for decision making. – National Associations such as the Coeliac Association of Ireland can be another source of information. – My post, Customer personas, who rules the roost? references the The Bord Bia document, ‘Irish Foodservice: Channel Insights November 2013‘ as a must read for anyone in the foodservice business. Eurostat is the European Statistics Office. Professional Associations and Trade Bodies may also have published reports. Some of these will be available only to members. ► Enterprise Ireland’s TechResources directory for Irish tech companies entering the US market. Information on companies (including limited financial information) can be sourced from Companies Registration Office (CRO) . Directories such as Thoms and Kompass also provide information about companies (customers/suppliers) sorted by company name, product sector, industry sector, and location. And don’t forget the Golden Pages in this regard. Newspapers and magazines can also be a major source of information on sectors and future trends with detailed archives of information. Check out Irish News Archive and Finfacts Factfinder is a subscription based online information retrieval on the top 5000 Irish companies – your Enterprise Board should have access for clients. Starting out, it may be difficult to identify sources of information. But I am always amazed at the information that can be collected and the expertise that business promoters gain from operating in a market over time. – Irish Publishing Market is growing ‐ Total Market Sales has increased by 9% (Source: Irish Book Publishing Survey 2005.) The report gave figures for total market size of retail sales of books and breakdown by category. Educational books accounts for approximately 80% of all children’s books. You may find that information is available on the UK market which can prove interesting in forming assumptions about the Irish market. I also researched the boardgame market in Ireland, the UK and the US about 18 months ago. [Sources available on request but all of this was freely available online]. – In 2005, Games and puzzles accounted for 4.1% equivalent to approximately €11.4 million of the Traditional Toys and Games market which was valued at €279 million at retail prices as estimated by industry sources. In that year, the average expenditure on toys and games per child in the age group of 0-14 years was €326. This is higher than the EU average of €168. – In the UK, consumption of traditional toys and games reached €2.7 billion in 2005, an annual increase of 4% compared to 2001. The UK is the largest market in the EU, with a share of 24%. Imports totaled €689 million, increasing by an annual average of 7.8% since 2001. Games and puzzles were valued at £388 million being 12.3% of the UK market. – The most recent data was available on the US Market. For the 12 months ending July 2009, the US toy industry tallied $21.6 billion in sales. Among specific toy supercategories, Games and puzzles were up 5 percent for 2009’s first half (helped by a 10 percent gain in board game sales) and up 2 percent for the 12 month timeframe. (Main reason given is that board games are cheap and provide value with hours of fun during recessionary times). A useful online tool for secondary market research is the Google Adwords. Their keyword tool is fantastic for finding out what keywords people are searching for and how many times a keyword and related words are searched for in a geographic area. For example, as a Business Advisor I would like anyone interested in starting a business in Ireland to find this website. Google Adwords can tell you that there were 4,300 searches in February 2011 in Ireland across 44 searchwords related to Business Startup. The top ten keywords: business startup, business startup funding, business startup ideas, business startup grants, small business startup, business startup loans, small business startup loans, business startup loan, small business startup grants, and business startup checklist accounted for 1,900 searches. 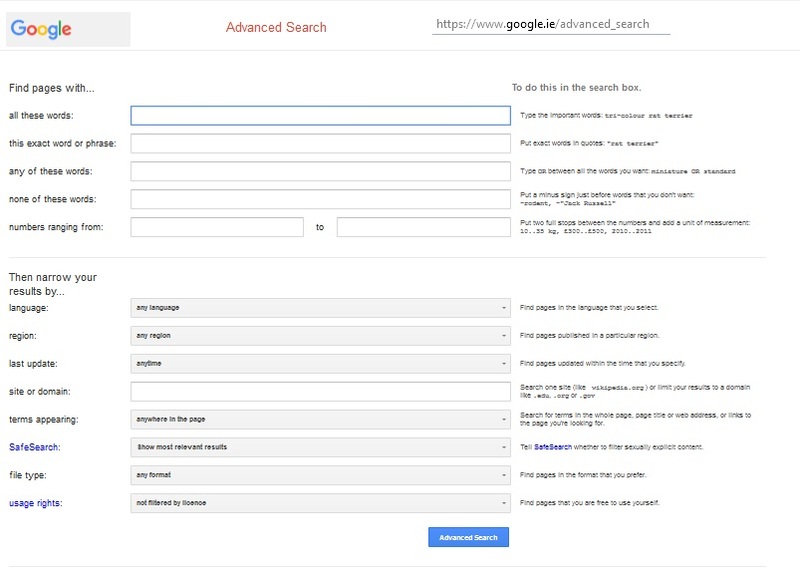 Google has a great tool within Search called Advanced Google Search. This can allow search for specific keywords and long key phrases with the results limited to PDFs. If someone has created a pdf it will generally be a substantial document and many include useful market information. It can take a few hours to find out if there are documents online that may be useful. Summaries of reports on MarketsandMarkets.com and MarketResearch.com can be very useful starting points. So if for example one googles ‘compost market ireland pdf’, a range of reports will be sourced. There is a very detailed report from 2012 entitled ‘Market Report on Irish Compost Production and Use’. ► The secondary research process can be completed rapidly. When secondary data is available, the researcher need only locate the source of the data and extract the required information. ► Secondary research is generally less expensive than primary research. The bulk of secondary research data gathering does not require the use of expensive, specialized, highly trained personnel. ► Secondary information pertinent to the research topic may not be available. Much secondary data is several years old and may not reflect the current market conditions. ► Data may be in a different format or units than is required by the researcher. ► Some secondary data may be of questionable accuracy and reliability. Secondary research is hugely important for both consumer and business-to-business (B2B) market research. Secondary research lays the groundwork and primary research helps fill in the gaps. By using both types of market research, business owners get a well-rounded view of their market and have the information they need to make important business decisions. The broad objective of a business plan is to chart an action plan for the company. They generally have specific objectives to include: seek investment from private investors, secure bank finance or encourage key employees to join the company. Demonstrating expertise and knowledge of the market is a critical ingredient of business plans. To conclude, marketing research should be conducted on an ongoing basis. Developing a process of ongoing secondary data collection is an important part of the marketing function. Subscription to trade magazines and attendance at trade shows to meet with collaborators/competitors are two elements of this process. As always, comments are appreciated – particularly those that mention sources of information not included in this article. While Google is straightforward, it’s worth knowing that searchers can, with just a bit more inside information,become really super searchers, writes Daniel M. Russell of Google Mountain View.